My name is Neiles Billany. I was born in Mufulira in 1952. While growing up I loved the bush and the wild places. At eleven I went to 'bush training.' This was run by part-time rangers who monitored the bush around Mufulira. We would go out on weekends camping and learning bush skills. My dream was to be a game warden when I grew up. The older boys would spend time on game reserves during the school holidays helping the rangers. Unfortunately when I became old enough the 'bush training' scheme had been disbanded. One of the tasks of the part time rangers was to track lions and keep them away from the town and farms. If a farmer spotted lions they would notify the game rangers (hopefully not to shoot them) but to track them and divert their course. This would be done using fire or by just shouting and making noise. One year when I was twelve I was lucky enough to be involved although to my disappointment I never saw a lion. We found their fresh spore where they had slept. I had to stay in the land rover while the rangers spread out in a line beating the bush with sticks to move the lions on. Neiles Billany achieved another dream. 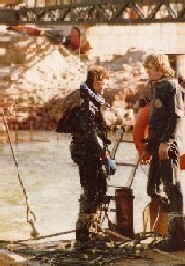 In 1977 he went to Britain and trained as a Commercial North Sea diver. He worked for many years in the North Sea. Now Neiles Billany an ex North Sea diver lives in the UK with his lovely wife whom he met in his early days of diving. The Billanys have two children; a son and a daughter. The son is studying geology…wow! You may contact Neiles by clicking here .